"Do you know how many laws you've made?" "Do you always have to wear a dress like that?" "Have you met Donald Trump?" 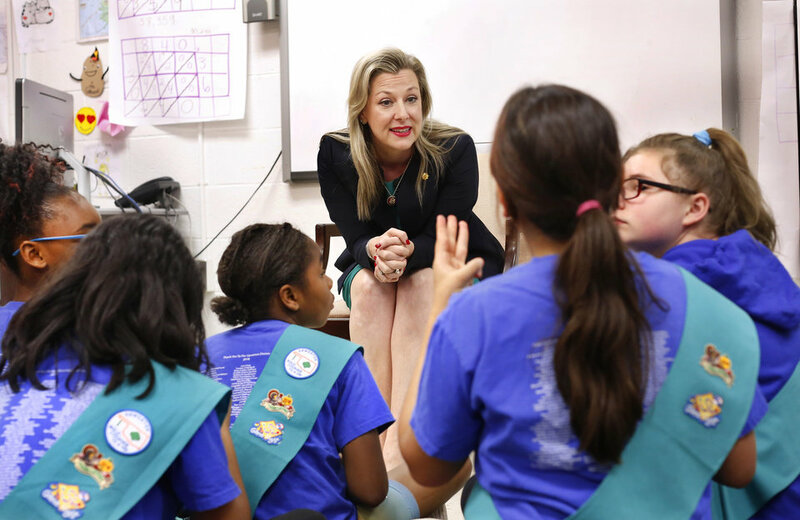 The Girls Scout troop at Positive Tomorrows in Oklahoma City had a lot of questions Monday for U.S. Rep. Kendra Horn. They had a lot of answers, too. One gave succinct explanations of how bills become law and how black holes work. Another cited her own recent role in the judicial branch, as part of a mock trial. "I was the attorney for Goldilocks," she said. The troop is composed of third, fourth and fifth graders. Nine girls at the nonprofit elementary school for homeless children attended the meeting on Monday; they talked with Horn about government, recited the Girl Scouts pledge and sang songs with the congresswoman. "Right now, I work for about 750,000 people," Horn said, referring to the number of constituents in her district, which includes most of Oklahoma County and Seminole and Pottawatomie counties. "Just you?" one girl asked. Horn explained that she had staff members in Oklahoma City and Washington, D.C., who help, which prompted another question about her mode of transportation between Oklahoma and Washington. "I fly almost every week back and forth," said Horn, D-Oklahoma City. 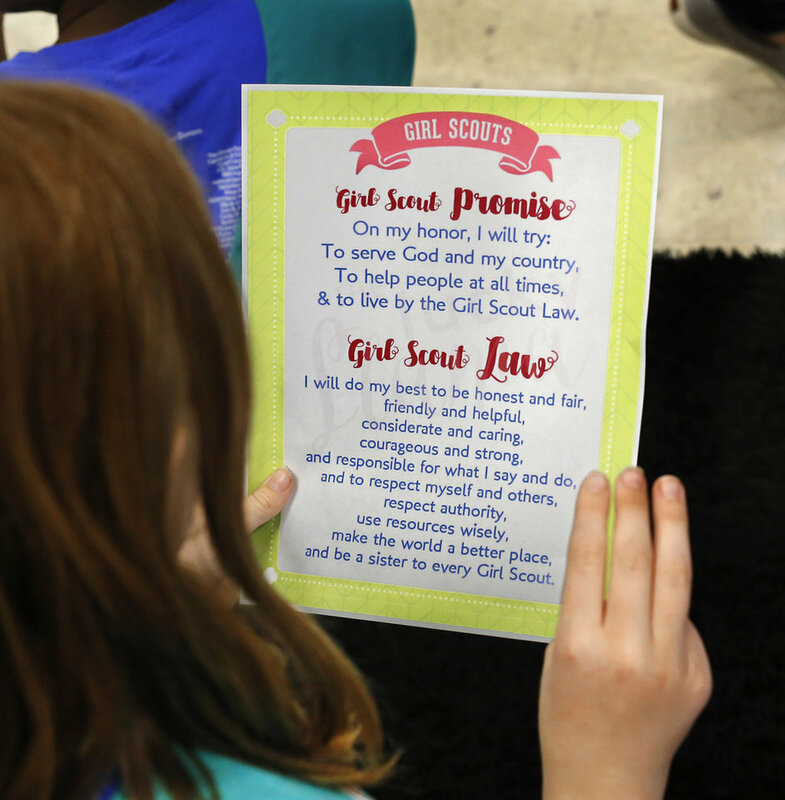 Horn said her mother, grandmother and great-grandmother had been Girl Scouts. She said she started when she was in first grade. She praised the diversity of the organization and asked why it was important to have a group made up of people from all walks of life. "Because you never know what happened in their background," one girl replied. In response to other questions, Horn said she had cosponsored legislation that was still winding through the process so she didn't know yet how many laws she has made. "I'll keep you posted on that," she said. Horn said she prefers dresses but doesn't have to wear one all the time. And she said she hadn't met President Donald Trump. "I was in the same room with him, during State of the Union" speech, she said. 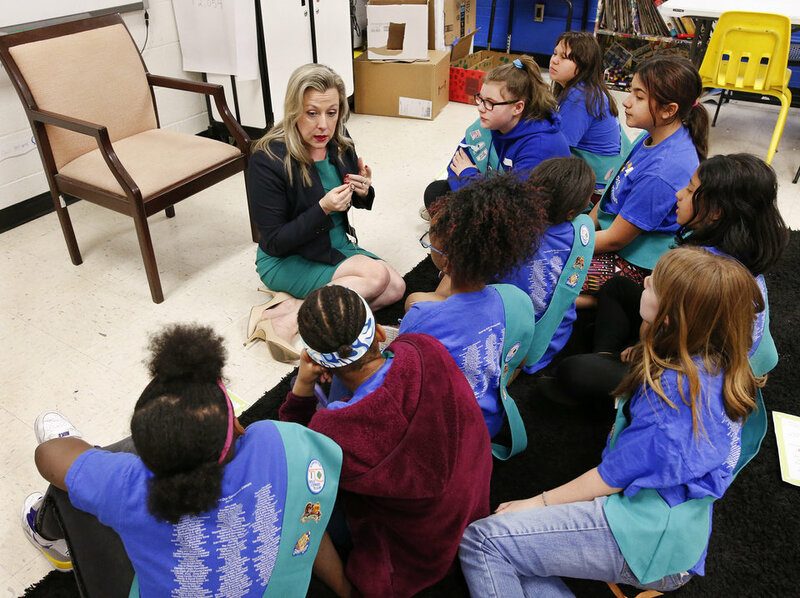 U. S. Rep. Kendra Horn visits a Girl Scout troop on Monday afternoon, April 15, 2019, at Positive Tomorrow School, a school dedicated to educating homeless students in Oklahoma City. Photo by Jim Beckel, The Oklahoman. 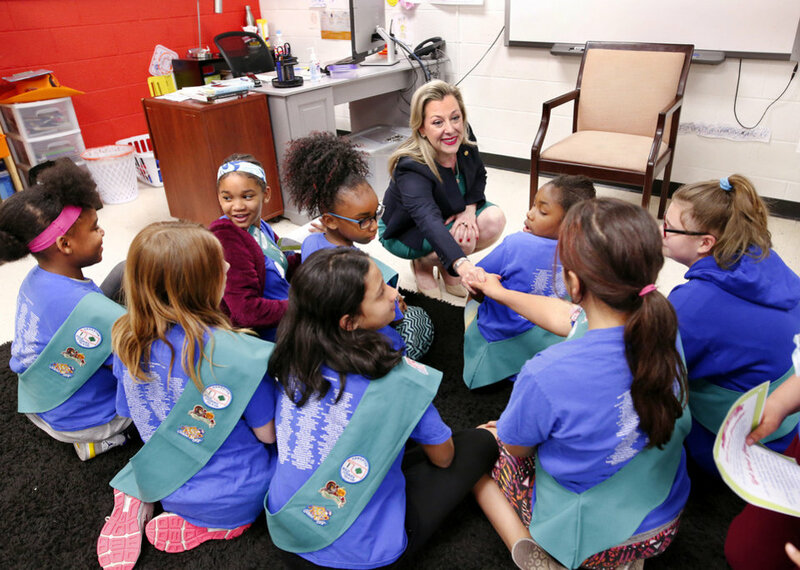 U. S. Rep. Kendra Horn greets each student upon her arrival to visit a Girl Scout troop on Monday afternoon, April 15, 2019, at Positive Tomorrow School, a school dedicated to educating homeless students in Oklahoma City. Photo by Jim Beckel, The Oklahoman. U. S. Rep. Kendra Horn shows students the pin issued to her to signify she is a member of the House of Representatives. Many members wear the pin on the lapel of their coat but she showed the girls how she put a chain on hers and usually wears it like a necklace around her neck. 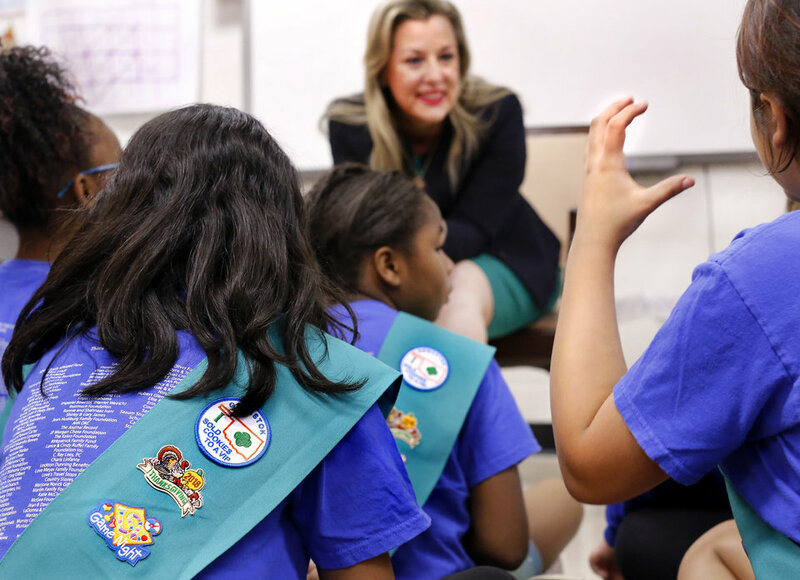 Horn visits a Girl Scout troop on Monday afternoon, April 15, 2019, at Positive Tomorrow School, a school dedicated to educating homeless students in Oklahoma City. Photo by Jim Beckel, The Oklahoman.